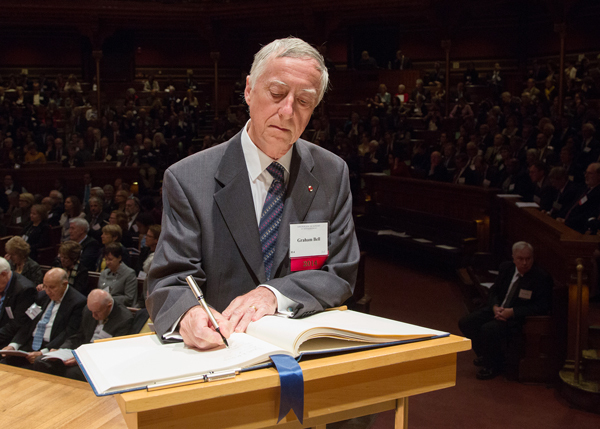 Graham A.C. Bell, James McGill Professor of Biology, was among one hundred-sixty four influential artists, scientists, scholars, authors, and institutional leaders who were inducted into the American Academy of Arts and Sciences at a ceremony in Cambridge on Saturday, Oct. 11. Founded in 1780, the American Academy is one of the nation’s oldest and most prestigious learned societies, and an independent research centre that draws from its members’ expertise to conduct studies in science and technology policy, global security, the humanities and culture, social policy and education. Since its founding by John Adams, James Bowdoin, John Hancock and other scholar-patriots, the American Academy has elected leading “thinkers and doers” from each generation. The current membership includes more than 300 Nobel laureates, some 100 Pulitzer Prize winners and many of the world’s most celebrated artists and performers.